How to import to Belgium? What are the import procedures in Belgium to move goods? Explain about import registration process, cargo movement to Belgium from overseas countries, Import delivery process in Belgium etc. 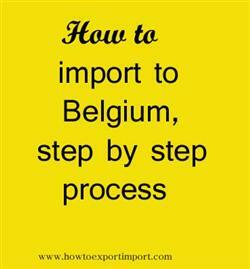 This post explains about step by step procedures that need to be finished with Belgium government authority for importation to Belgium. The official Customs and Excise department of Belgium is administered by Federal Public Servise under the Ministry of Finance (FPS Finance). Importers should submit or enter the required data in the import clearance system via an EDI interface to the Customs computer Paperless Customs and Excises (PLDA) system. The import declaration, including security data, has been compulsorily submitted online via the PLDA-program (ICS = Import Control System). The importer can likewise declare the goods by presenting a finished Single Administrative Document (SAD form) to Belgian Customs. The official model for written declarations to customs is the Single Administrative Document (SAD). The SAD delineates products and their movement around the world and is fundamental for trade outside the EU, or of non-EU merchandise. Merchandise brought into the EU customs area is, from the time of their entrance, subject to customs supervision until customs formalities are finished. Items are secured by a Summary Declaration which is documented once the things have been shown to customs authorities. This post explains about different phases in import process that every importer needs to go through in Belgium.